AMES, Iowa (AP) — Its winning streak snapped and no longer in contention for a championship, No. 25 Iowa State now has to focus on something else. That should not be a problem for coach Matt Campbell and his players because they still can go where few Iowa State teams have gone before. The Cyclones saw their hopes of playing in the Big 12 championship game buried under the swarm of an aggressive Texas defense in Austin last week. 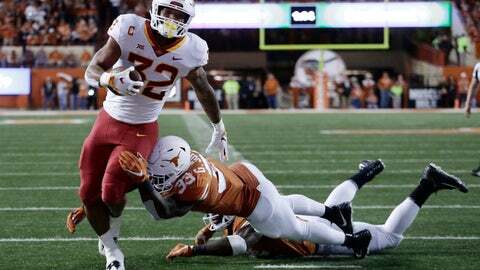 The offense never found any footing and Texas gashed what was then the league’s top defense for 405 yards in a 24-10 victory that snapped Iowa State’s five-game winning streak, its longest in 16 years. — No Iowa State team ever has won six conference games. This one would do that with a victory in Saturday night’s home game with Kansas State (5-6, 3-5), which needs a win for bowl eligibility. — Only a handful of Iowa State teams have won eight regular-season games and it hasn’t happened since 2000. That would occur if Iowa State beats the Wildcats and then wins its final regular-season game Dec. 1 against Drake. — Only one Iowa State team in modern times has won nine games. The Cyclones would do that if they tack on a bowl victory and finish with three straight wins. Iowa State is paying attention to this week’s opponent for now: It has lost 10 straight games to Kansas State, the only Big 12 team the Cyclones’ seniors have not defeated in their careers. While frustrating, the Texas loss appears to have been filed away and forgotten. If anything lingers from that night, it’s injuries. Freshman quarterback Brock Purdy and defensive back D’Andre Payne both were dinged up in the game. Purdy is back at practice, but Payne, a key figure in the secondary, is questionable. It’s also a test for Purdy, who was the catalyst in the winning streak with his passing and ability to keep defenses off balance with his running. It was the first time the Cyclones had lost since he became the starter and was by far his worst game. He finished just 10 of 23 for 130 yards, did not throw a touchdown pass and was sacked five times. Iowa State announced Tuesday that its opponent Dec. 1 would be Drake and not Incarnate Word, which said it had opted out to focus on the FCS playoffs that begin Saturday. The game replaces Iowa State’s opener with South Dakota State that was canceled after a few plays because of lightning on Sept. 1, the same storm system that canceled Drake’s opener in nearby Des Moines. Drake (7-3) and Iowa State have not met since 1985. Drake coach Rick Fox said his team was excited.